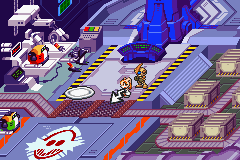 Gimme Shelter is the fifth world visited in Sonic Battle for the Game Boy Advance. Inexpertly concealed amongst the bars and casinos of Central City's Night Babylon gambling district, Gimme Shelter is a compact secret hideout for Doctor Eggman. Featuring Guard Robo production facilities and a terminal to the Mother Computer, it is in Gimme Shelter that Eggman conducted his early experiments on Emerl, before rashly tossing the Gizoid out to sleep with the fishes. First accessed in Knuckles' episode - where the echidna runs headlong into an electroparalysis trap - the area also comprises the entirety of Cream's story, after she and Emerl are kidnapped from Amy's apartment and held to ransom. The robot and the rabbit smash their way out of the facility through hordes of Guard Robos and E-121 Phis, booting aside Chaos Gamma to make good their escape. Due to the non-linear nature of Sonic Battle's stages, other characters return to Gimme Shelter in their own episodes. Shadow's story begins with him Chaos Controling into the laboratory after feeling the emanations from Emerl's absorption of the first Chaos Emerald. Rouge, having already snuck in there by more conventional means, has to physically carry a comatose Shadow out when his strength fails him. The Metal Depot Battle Arena. There is only one battle arena for Gimme Shelter: Metal Depot. A particularly long, rectangular battlefield, Metal Depot is much loved by those players who prefer to run and hide in a corner until their Ichikoro Gauge is fully charged. Chaos Gamma remains here for training after his defeat at the end of Cream's story. Gimme Shelter is the only Eggman base to be named after a Rolling Stones song! This page was last edited on 17 January 2019, at 13:05.